Spoil your mum with a delicious high tea in the Hospital Precinct of Sydney’s former Quarantine Station, with stunning views of Sydney Harbour. Tickets include a substantial high tea of savouries and sweets, tea and coffee plus a complimentary glass of sparkling on arrival for all mothers. A cash bar will be available for additional beverages. 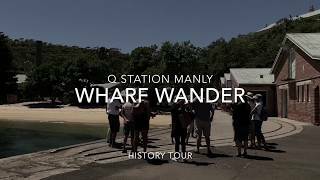 Upgrade your experience with a Wharf Wander tour! Learn about the history of Q Station and explore some key spaces including the old autoclaves, sandstone inscriptions and shower block before concluding the tour at the hospital, where High Tea is served. The Wharf Wander history tour runs for 45 minutes and tickets can be purchased with your High Tea ticket. The tour will start at 2pm with perfect timing to conclude at the start of the high tea.